1 of 1 Add 1 tbsp olive oil to a large skillet over medium heat. Sauté 1 small diced onion 5 minutes. Add 6 cloves sliced garlic, 8 chopped anchovies, 1/2 tsp red pepper flakes; cook 2 minutes. 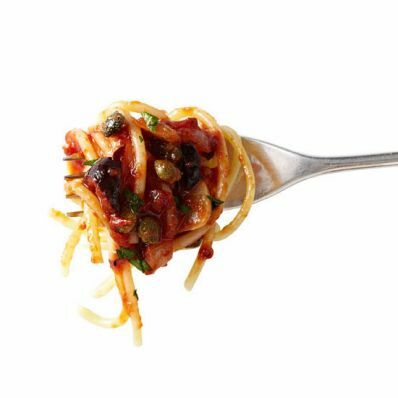 Stir in 28 oz crushed tomatoes, 1/3 cup pitted and chopped Kalamata olives and 2 tbsp capers. Simmer 15 minutes, then toss with 1 lb cooked spaghetti and chopped parsley. Serves 8.